JetBlue’s first commercial flight from New York City to Havana took off from John F. Kennedy Airport on Monday morning — a milestone that comes as the island nation mourns Fidel Castro, who died just last week. 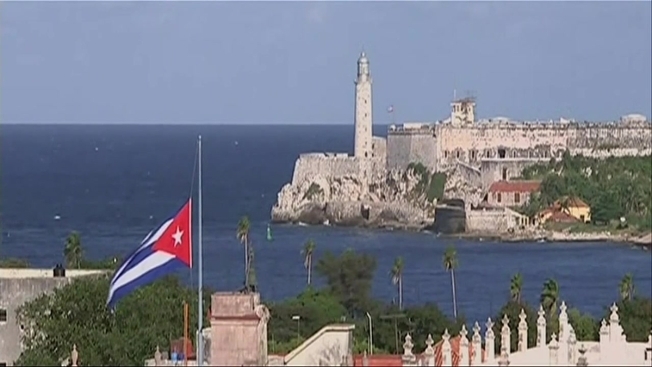 The regularly scheduled flight was set to take off at 8:58 a.m. and will land in Havana. After a slight delays, the plane was in the air and on its way to the Cuban capital. Along with JetBlue, American Airlines is also running a short, one-hour commercial flight from Miami to Havana on Monday. Delta Air Lines has scheduled regular flights to Cuba, including from New York City, starting on Dec. 1. JetBlue plans daily flights to and from Havana, and it’s an exciting time for many Cuban Americans, some of whom haven’t seen their family in years. In Cuba, preparations are underway for the state funeral of former leader Fidel Castro. Some in Havana mourned Castro's death, while others looked to an uncertain future. Stefan Holt reports. Back in July, JetBlue officially began direct flights to Cuba out of JFK when a charter flight flew to Havana's Jose Marti International Airport. U.S. regulations now allow 12 categories of travel to Cuba. Americans without family ties in Cuba can go there if their trip fits into one of those categories, such as educational. The Queens-based airline announced Monday that it was canceling a concert planned for 7 a.m. at JFK. The event, which was to include a musical band and dancing, was scrapped because of Castro’s sudden death on Friday, JetBlue security personnel confirmed. Back in Havana, tens of thousands of people are expected to pay their respects to Castro at the Plaza de la Revolución on Monday before his ashes are taken across the country. The event in the plaza is part of an eight-day period of mourning for the polarizing, yet revolutionary former Cuban leader. There’s no dancing, drinking or partying in Havana, as no kind of celebration is allowed during the mourning period. A number of airlines, including Frontier, Southwest, Spirit and United will also start flights in the coming weeks.